Its been a month since I added this certification in my list, this is one of the designer exam which I wanted to give in the first place, its averagely complex but not much difficult. So if you have atleast 4 years of salesforce experience that includes Data management practice, and experience with high volume data handling, then a little brush up of work can make you pass this certification. This blog post is all about thing to cover up before going for the exam. Use the PK Chunking request header to enable automatic primary key (PK) chunking for a bulk query job. PK chunking splits bulk queries on very large tables into chunks based on the record IDs, or primary keys, of the queried records. Each chunk is processed as a separate batch that counts toward your daily batch limit, and you must download each batch’s results separately. PK chunking is supported for the following objects: Account, Campaign, CampaignMember, Case, Contact, Lead, LoginHistory, Opportunity, Task, User, and custom objects. PK chunking works only with queries that don’t include SELECT clauses or conditions other than WHERE. PK chunking is designed for extracting data from entire tables, but you can also use it for filtered queries. Because records could be filtered from each query’s results, the number of returned results for each chunk can be less than the chunk size. Also, the IDs of soft-deleted records are counted when the query is split into chunks, but the records are omitted from the results. Therefore, if soft-deleted records fall within a given chunk’s ID boundaries, the number of returned results is less than the chunk size. Salesforce creates skinny tables to contain frequently used fields and to avoid joins, and it keeps the skinny tables in sync with their source tables when the source tables are modified. To enable skinny tables, contact Salesforce Customer Support. For each object table, Salesforce maintains other, separate tables at the database level for standard and custom fields. This separation ordinarily necessitates a join when a query contains both kinds of fields. A skinny table contains both kinds of fields and does not include soft-deleted records. This table shows an Account view, a corresponding database table, and a skinny table that would speed up Account queries. For Full sandboxes: Skinny tables are copied to your Full sandbox organizations, as of the Summer '15 release. Previously, they were not. The Salesforce multitenant architecture makes the underlying data table for custom fields unsuitable for indexing. To overcome this limitation, the platform creates an index table that contains a copy of the data, along with information about the data types. The platform builds a standard database index on this index table, which places upper limits on the number of records that can be returned more effectively by an indexed search. The REST-based Bulk API was developed specifically to simplify the process of uploading large amounts of data. It is optimized for inserting, updating, upserting, and deleting large numbers of records asynchronously by submitting them in batches to Force.com, to be processed in the background. Uploaded records are streamed to Force.com to create a new job. As the data rolls in for the job it is stored in temporary storage and then sliced up into user-defined batches (max of 10,000 records). Even while your data is still being sent to the server, the Force.com platform submits the batches for processing. The Salesfore.com Data Loader v17 supports the Bulk API so it's easy to get started upload large datasets. Your user profile must have the "API Enabled" permission selected so if you are a System Administrator, you are all set. To get started, open up the Data Loader and edit the settings for the Bulk API. 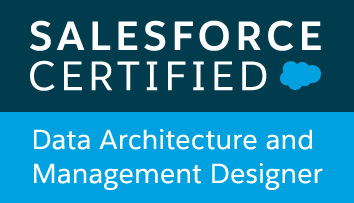 Salesforce Data-Architecture-And-Management-Designer real exam dumps doesn’t bring me only good result but it gave me shrewd understanding of the discipline. This handy PDF description of the contents encompassed the whole subject which is very useful for me in the practical field. I commend realexamdumps.com for such a useful gift to IT students. My recommendation for all candidates is to choose Salesforce Data-Architecture-And-Management-Designer dumps and get guarantee for their success.